Food Adventures of a Comfort Cook: This Cookhouse ain’t just for cowboys. This Cookhouse ain’t just for cowboys. We’d heard talk that the Cookhouse was under new management, and we thought we’d give it another try. Roy and I had not been to the Cookhouse since September of 2009. Why you might ask? I had asked our waitress, “Why don’t they serve real roast turkey in the open face sandwich, but thin sliced cold cuts instead?” Her response had been, “Our menu is too big to be able to serve real food.” “Real food? You mean I’m paying good money for fake food?”; and her attitude towards me did not get any better with that little comment of mine. We decided to give the new manager a good look over and see what changes, if any, the Cookhouse had experienced. We showed up at 2:30pm, well past lunch, and way before dinner. Dan greeted us immediately, seated us at a sunny booth and took our drink orders. The décor had not been changed; opening the menu, we didn’t see many changes, but they were there. A new item was the Southwest Eggrolls, a favorite of Roy’s, and I had to have my Corn Nuggets. For a main meal, Roy chose the Philly Cheese Steak sandwich, and I got the Bacon-Swiss burger; we both had fries as a side. For us, if an eatery messes any of these items up, then they have a problem. Within 10 minutes we had our appetizers; the Eggrolls were crispy; the filling of beans, cheese and chicken was not overly spiced, so tasted great whether we used the ranch dressing or not. The Nuggets were crispy on the outside, creamy and corn filled; a carb lover’s dream. Ten minutes after that we had our main meals; and Dan made sure to keep our drink glasses filled. Philly Cheese Steak – thin sliced, grilled, sirloin steak, grilled peppers and onions, Swiss cheese piled on a toasted roll. Delicious and the grilled taste of the steak and veggies made it more so. Bacon-Swiss Burger – a 1/3 lb grilled burger on a toasted bun, Swiss cheese covering it and thick sliced bacon (Roy stole some and rolled his eyes in delight – pig heaven!). The accompanying vegetables were (lettuce, tomato, onion, pickles) looked and, here’s the important part, tasted fresh. Fries – shoestring cut potatoes, crispy on the outside, fluffy on the inside, and just the right amount to go with our sandwiches. Since it wasn’t busy; we were the only folks in the place until we were getting ready to leave, then another couple came in; Dan seated, served and cooked our meal. He did very well on his own; and he’s very friendly when you start talking with him. I told him the story on why we haven’t been going there, and he reassured us that his food has been updated and improved – it’s real food. Just talking with him, you could tell he has a passion for what he’s trying to achieve with the Cookhouse. We definitely intend on trying out the dinner hour, and seeing what changes to the menu have occurred there. 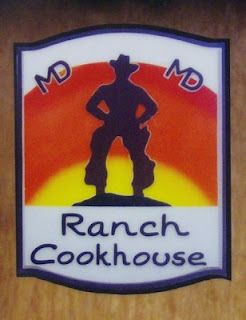 The Cookhouse is located on Route 191, going south towards Blanding, and is easy to spot. It will be serving breakfast, lunch and dinner once the tourist season rolls around; hopefully they’ll be able to reestablish their liquor license. I do have a couple of suggestions for Dan though. When first entering, off to the left, there is an area which has some souvenirs and postcards for sale. That would make a great area to have a buffet set up; especially on the weekend – a brunch which offers the best of breakfast and lunch; then offering the regular dinner menu when that time comes round. Secondly, advertise! 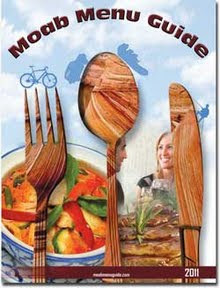 Not just the local papers, but hit the restaurant guide that’s printed in Moab – tons of tourists travel through there, and what better way to let them know about the Cookhouse? No recipe from me today folks, but you could always try out the Cookhouse if you’re feeling hungry.